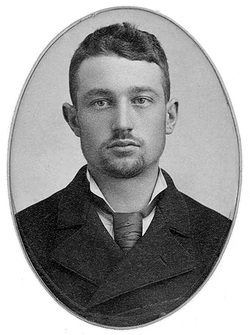 Youngest of the Haymarket martyrs, Louis Lingg came to the U.S. from Germany in 1885, only a year before the Haymarket incident. Blacklisted in Chicago after refusing to act as a strikebreaker during a carpenters' walkout, he became known as "the most dangerous anarchist in all Chicago." As a Carpenters' Union organizer, active in the Trades and Labor Assembly, he was one of many clubbed during the protest at the McCormick Reaper plant. During the trial of the Haymarket Eight, Lingg's speech to the court was regarded as a masterpiece of intransigence. While his death was ruled a suicide, it is widely believed he was killed by police in his cell on the morning before the Haymarket hangings.